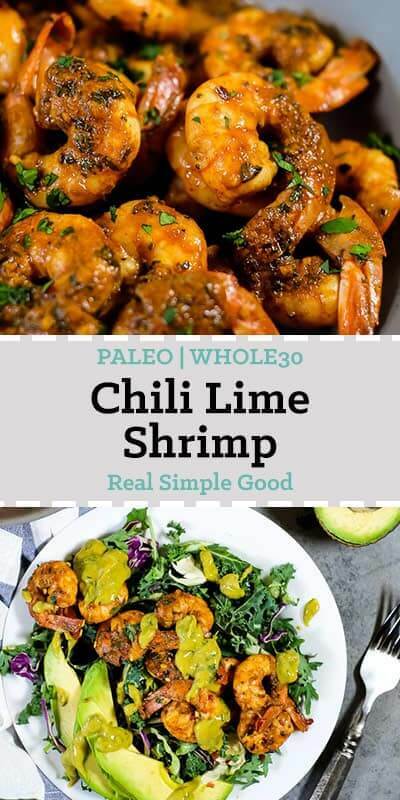 We love making this Paleo + Whole30 cilantro lime shrimp because it can be paired with just about any veggies and greens to make a complete and balanced meal. 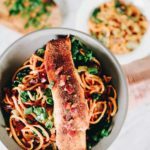 And it’s a quick and easy meal to throw together on a busy weeknight! 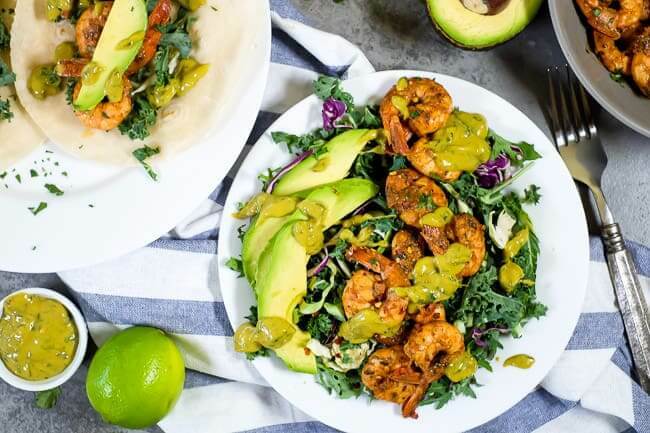 You can toss any greens and veggies you have on hand to make a salad and top it with this chili lime shrimp. Or you could add greens and some white rice together in a bowl and top that with the shrimp. You can also make tacos with either lettuce for shells or Siete Tortillas! 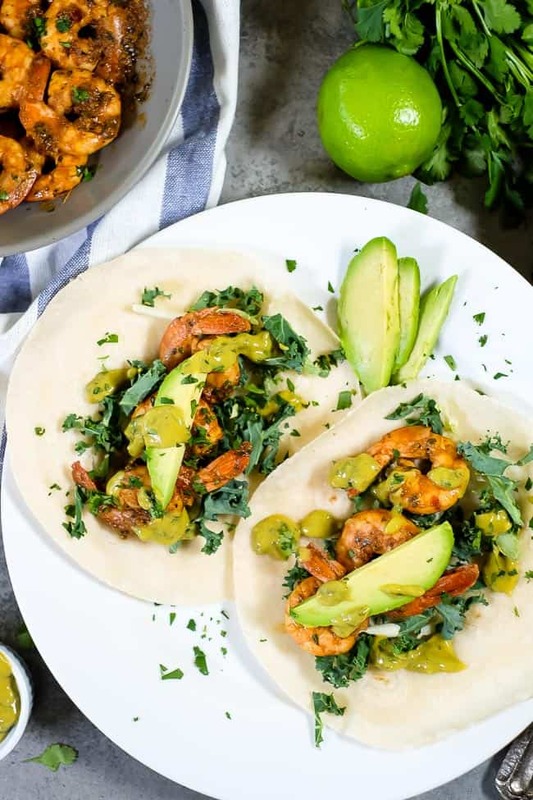 There are seriously so many options and ways you can turn this chili lime shrimp into a meal! 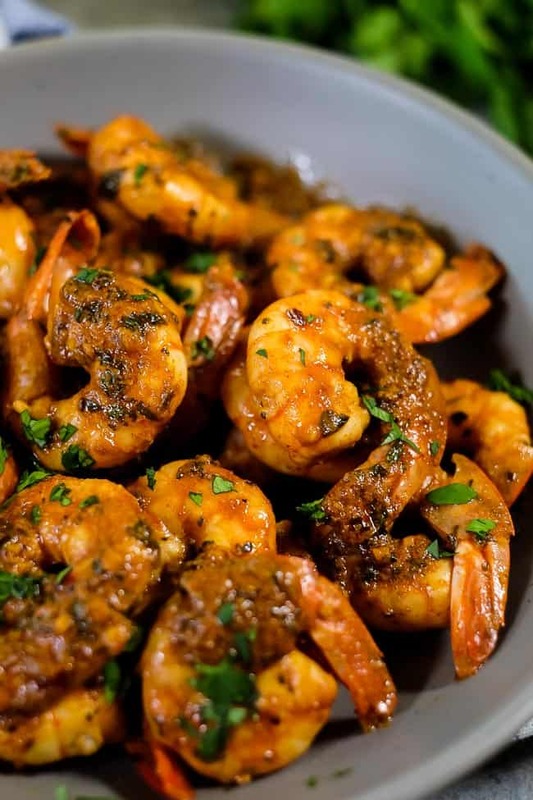 You just mix the marinade for this chili lime shrimp up real quick and then let the shrimp hang out with it while you make the sauce to drizzle over your shrimp once it’s done. The marinade itself is really more like a paste and it coats the shrimp pretty well. 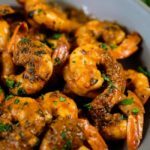 When you cook it up on the stove (or BBQ), the shrimp stay pretty well coated in the marinade and you end up with super flavorful shrimp. So, don’t worry that it doesn’t marinate for too long at all. That’s kind of the best part about making shrimp – it cooks really fast! Just a couple of minutes on each side until the shrimp turn pink, and you’re good to go! We like to make sure we have all the other pieces of the meal together before we put the shrimp in the skillet. 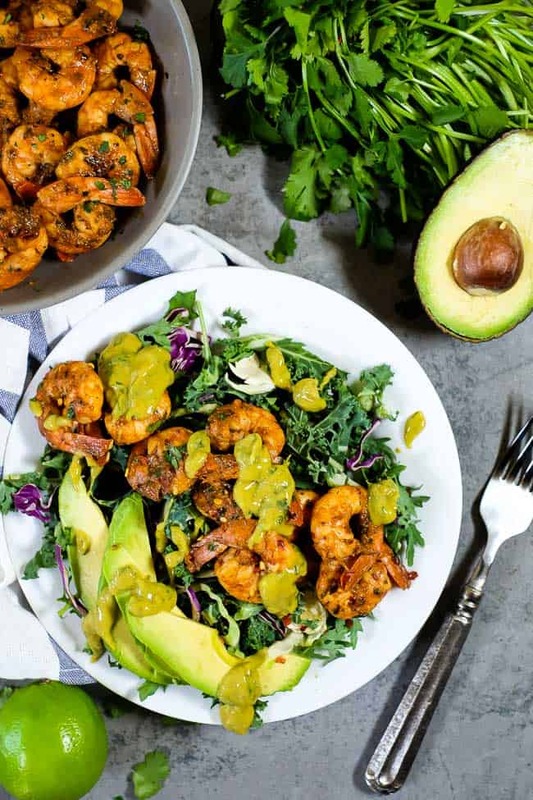 That way, as soon as the shrimp is done cooking you can add it to your salad, bowl or tacos (or whatever else you come up with)! 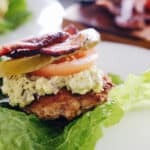 Add this to your meal plan for the week when you absolutely need a quick and easy meal! Let us know how you end up making your shrimp into a meal – salad, bowl, tacos or something else – by leaving a comment below. Take a photo and share it on Instagram! Tag us @realsimplegood, so we can see! Also, give us a follow on Instagram if you don’t already, so we can stay connected! Busy weeknights, long days and little energy to throw together a healthy dinner once you get home - sound about right? 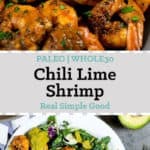 Well, this Paleo + Whole30 chili lime shrimp is a quick and easy dinner, made in just 20 minutes! It's also versatile and can be paired in many ways for a complete healthy meal. In a small bowl, whisk together the marinade ingredients. Place the shrimp in a shallow bowl or zip-top bag and pour the marinade over the shrimp, tossing to coat. Set aside to marinate while you prep the sauce. For the sauce, combine all of the sauce ingredients in a blender or food processor with the chopping attachment. Blend/process until it reaches a smooth consistency. Refrigerate until you are ready to serve. 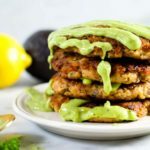 Heat a large skillet over medium heat and add in some avocado, olive or coconut oil. Once hot, add the shrimp and cook for 2-3 minutes per side, until the shrimp is pink and cooked through. Alternatively, you could place the shrimp on skewers and cook on the grill. Serve shrimp drizzled with the sauce. 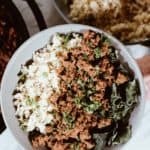 Serve over greens as a salad, over rice or cauliflower rice or in taco shells! Absolutely love it!! Definitely making it again! ? If not a big shrimp fan, do you think substituting chicken would work okay? Yeah, chicken should work! You’ll just have to cook longer until it’ fully done. 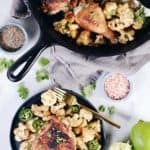 I’d cut it up into small bite sized pieces before cooking if you’re using breast or thighs to speed up the cooking time. Enjoy! Made this tonight and we LOVED it. 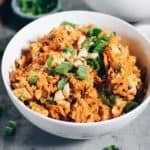 We served it over cauliflower rice and devoured it. Easy, quick and full of flavor. I will definitely be making this again.